Hide deals from seller "Bravo Handbags"
Click ‘Get It’ and select $100 option, $200 option, $300 option or $400 option. Valid toward any merchandise. Full value of Gift Certificate must be redeemed in 1 transaction. $50 for $100 toward merchandise. $100 for $200 toward merchandise. $150 for $300 toward merchandise. $200 for $400 toward merchandise. 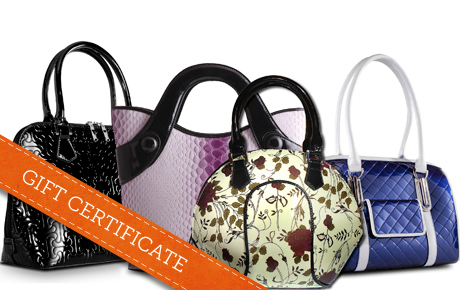 In business for 15 years, Bravo Handbags offers beautiful and innovative accessories that are built to last. Their Beverly Hills collection has won numerous design awards at international leather goods fairs around the world. Celebrities like Felicity Huffman of “Desperate Housewives” and Ariel Winter of “Modern Family” have been spotted toting these chic purses. You’ll look trendy day or night with classic styles, like Anita Blue from their popular Quilted Boxes collection or Dundee Crocodile, an enamel-coated calfskin leather purse with beautiful details. Online retailer offering a variety of Italian and synthetic leather accessories.